An important part of a business, it’s very identity, is its culture. And it’s possible to develop one, but it’s largely intangible. It’s a collective attitude, not something you can put your finger on. It becomes an intellectual and emotional thing, like enthusiasm. 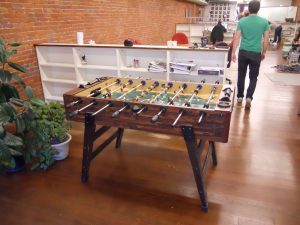 Some companies try to manufacture a culture by recreating many of the things they see other companies do, such as foosball tables and beer refrigerators in some of the more fun companies. While it’s possible to have all the trappings of a fun company, putting a foosball table in the center of the office doesn’t make you a fun company, especially if you have a lot of can’t-miss hard deadlines worth hundreds of thousands of dollars and management that doesn’t care about its workers or their need for work-life balance. As a new manager or even a new entrepreneur, creating a business culture (or even a departmental culture) starts with you. What do you want to be known for? Not in terms of your products or services, but what do you want to be known for among your staff and the industry? Because as your people move on and go to other companies, they’ll talk about what it was like to work for you. These are the values that you’ll need to exhibit and encourage in your staff, and expect your managers to trickle down to their departments. State these values, write them up in a document, and make sure you refer to them regularly. Next, what kind of behaviors will you allow? You’ll get a lot of companies that will allow, and even encourage, that Type A, obnoxious, dog-eat-dog mentality where individuals put themselves and their accomplishments ahead of the organization. And you’ll get companies that won’t put up with it, encouraging more cooperation and teamwork, because those people know that if the company succeeds, they’ll benefit as well. If you’re willing to put up with, say, some competitiveness and rivalry between the salespeople, that’s fine. But you should set your expectations up front again, rather than trying to rein in behavior that’s gone too far. Third, what kind of behaviors will you absolutely not tolerate? Being able to articulate those things you won’t put up with — racism, sexual harassment, discrimination, etc. — not only shows your commitment to your ideals, it can even save you from a major lawsuit. All it takes is one employee to harass another employee, or one manager to discriminate against a potential employee, and an employment lawyer can slap you with a lawsuit so fast, your head will spin. These thou-shalt-not rules also need to be expressed up front, as part of your company values. I’ve spoken before about my four non-negotiables — Safety, Housekeeping, Productivity, and Check your ego at the front door and bring your brains inside — and this was something I had required at any business I was in. I especially picked number four because egos can be a real culture killer. I had to be very vigilant on a minute-by-minute, day-by-day basis, and I had to recognize when and whether I was being confronted by ego or facts when people disagreed with me. I also noticed that it was the men who were more likely to lead with their ego than with facts. The women would just focus on the task and not whether they were seen as right. They didn’t play those games and focused on getting the best outcomes. As a result, whenever I had to deal with someone who might bring a big ego through the front door, I would have to terminate them from the company, otherwise their attitude could kill the entire culture that I had worked so hard to build. I’ve been a manufacturing executive, as well as a sales and marketing professional, for a few decades. Now I help companies turn around their own business. If you would like more information, please visit my website and connect with me on Twitter or LinkedIn.